Teplar has been offering a variety of comprehensive Tableau BI services to different industries across the world. At Teplar, our Tableau consultants have enriched experience in Tableau development, which showcases competences that facilitates end users to gain data connectivity, visualization along with creation and sharing of dashboards securely at a fast-paced go. A leading BI tool across the world – as a very user friendly and simplistic tool, it has been the key strength areas for our Tableau developers and Tableau designers. Its powerful engine is highly accomplished to support multifaceted analytical problems. Tableau BI and its product stack, offer a totally ground-breaking approach in the platform of BI. Facilitating businesses to leverage connectivity, visualization & data integration to their best, this product stack creates visually attractive dashboards and reports. Data analysis is the process of obtaining information from data. 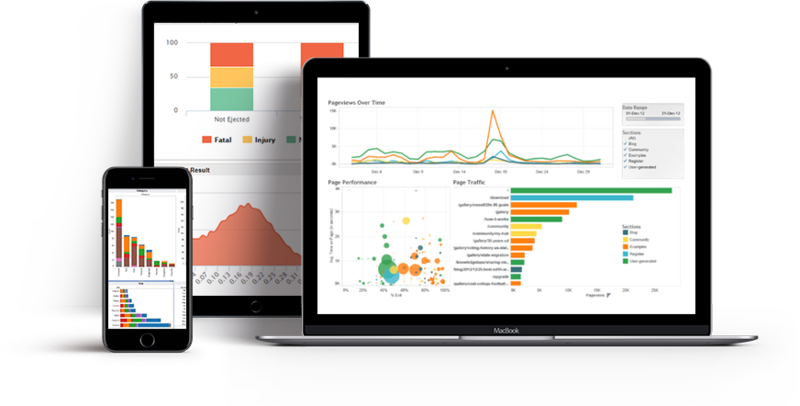 Data Analytics in tableau generally refers to an assortment of applications, from basic business intelligence (BI), reporting and online analytical processing (OLAP) to various forms of advanced data analytics. Data Visualization is the process of presenting the data in a manner that even a common people can understand it. A perfect mix of elegant elements like colors, dimensions, labels can create visual masterpieces, hence revealing surprising business insights, which in turn helps businesses to make informed decisions. At Teplar, our Tableau consulting experts are helping your business to maximize your investment and minimize your business risk. We are expertise in end-to-end tableau development and implementation, so you are always one step ahead of your business competitors. Teplar helps manage Tableau Environments to ensure high availability, maximize performance, reduce risk and achieve high amount of productivity. We always give 24x7 production support to our clients to achieve their business goals. Sentiment Analysis is otherwise known as Opinion mining. Sentiment Analysis is the process of identifying the emotional tone behind a series of words, used to get an understanding of the attitudes, opinions and emotions expressed within an online platform. Our globally spread clients speaks about the projects in Tableau Business Intelligence Consulting Services that provide a free hand to users in report generation, as per their business need. Our Tableau designing and developing experts have been building enriched BI solutions for the multi-faceted size of enterprises, showcasing Tableau's simplistic features, visualization capabilities, and inbuilt user experience. Why TEPLAR for Tableau BI Development? Teplar's solution and technical experts are well experienced with all latest technologies in relevant domains and can assure you of maximized RoI. Quality is at the wheel of our projects and we assure it gets delivered to our clients bringing in complete satisfaction. Our skilled Tableau resources are proficient at implementing Tableau product components with perfection, be it any industry or business. Our assorted engagement models help the client to choose amongst them, based on their business needs, budget, scope and work-flow.